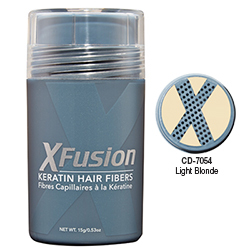 Keratin Hair Fibers - Light Blonde 15g. XFusion Keratin Hair Fibers blend seamlessly with one’s natural hair, adding volume and/or extra coverage for thinning hair, instantly. Fibers are suitable for all hair types including dry, damaged, color treated, fine and/or thin hair and are resistant to rain, wind and perspiration. Mix to match any hair color. Removes easily with shampoo.